When it comes to N-frame Smith & Wesson revolvers, I naturally gravitate to the Model 27. 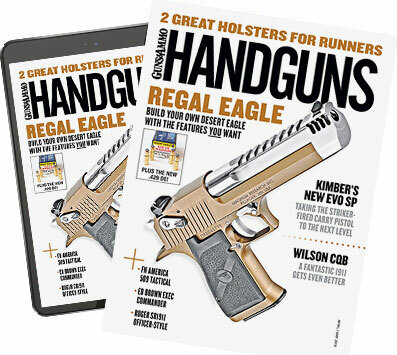 This handgun has been absent from S&W's catalog for a time. To the joy of many serious shooters, it's back, in the company's classic line. Like several other guns that made history, the Model 27 was born (in 1935) to chamber the then-new .357 Magnum cartridge. Even in the Depression, when money was tight, the gun had flair. At the time, it was the best you could buy and included the finest heat-treated steels available, a protected ejector rod and a cylinder countersunk for cartridge case rims. Essentially a custom-order revolver, it could be ordered with any choice of barrel length, sights, grips, triggers, finish and a finely checkered top strap. Certificate of ownership was included, and the gun was shipped in a fine presentation case. While S&W's new classic Model 27 does not have all of the above features, it retains many of them. For starters, the gun is available in carbon steel, blue or nickel finishes and can be purchased with a four or 6½-inch barrel, complete with the distinctive taper of the original. The four-inch model comes with traditional Magna grips; the 61/2-inch version comes with the once-popular checkered walnut "target" grips. These are newly styled for a thinner, more comfortable grip but use the traditional checkering pattern to maintain the resemblance to original Model 27s. The original 27 was without peer, and this new "reproduction" has nothing to be ashamed of in fit, finish or appearance, which is superb in every aspect. Like the original, the gun has a four-screw sideplate with the Smith & Wesson logo. Unlike original guns, though, the firing pin is now enclosed within the frame rather than mounted on the hammer. Single action trigger pull on the test gun measured five pounds and provided good controllability while accuracy testing at the range. The double-action pull was around 12 pounds with typical stacking and was certainly usable in fast-action scenarios. In all probability, the most distinctive feature of the original Model 27 was its checkered top strap. On this reintroduction, the checkering is simulated by a crosshatched pattern on the frame, but on the barrel, true checkering is applied right out to the front ramp. While the original Model 27 had checkering on the top strap, this has serrations that give the same effect. The system lock is visible just above the cylinder release.The firing pin is now housed within the frame. A four-screw sideplate is standard on the new classic Model 27. The polishing and finish work are impeccable.The original Model 27s had a shrouded barrel, and so do the new classic models. Sights have seen a few changes since the original Model 27, and this gun has a white outline and cross serrations on the rear sight blade. The front sight on the 6½-inch version features the traditional Patridge front blade; on the shorter gun, a ramp sight is pinned in place. society, Smith & Wesson's propriety locking system is accessed just above it. The frame has been beefed up around the recoil shield, and cylinder chambers have not been countersunk for case rims. This is a reasonable concession toward keeping manufacturing techniques affordable. Range testing consisted of running a variety of factory loads through the gun with both .38 Special and .357 Magnum ammo, with pleasing results, which may be seen on the accompanying chart. The only criticism I have of the gun is that the grips were, for me, a little too small for a large-framed gun, transferring much of the recoil to the web of my hand at the base of my thumb. Other than that, the gun handled like a dream. Over the years, I've enjoyed the shooting qualities of my Model 27s. If you haven't experienced one yet, now is the time.